Do you want to get more money and love this year? Now you can! Hooray– it’s finally February! Can you feel the energy shift? Some seriously magical, uplifting love is coming your way! January was funky AF. More like an old gym bag stuffed with sweaty shoes kind of funk, not the cool, hip Bruno Mars “Uptown Funk” kind of funk. Ideas were cloudy. Plans were muddy. Old issues and feelings came up making it difficult to decide what it was you truly wanted. At least that’s what I felt! Chinese New Year marks the REAL start of any year for me and it begins on February 5th this year. And this year, it is the Year of the Pig, and I am SO excited for this Pig energy! The Pig brings us the opportunity to fulfill any dreams or plans you have been putting off. This is THE year that you will be able to build the wildly successful and wealthy life that you want! YOUR WEALTH WILL BE DIRECTLY TIED TO YOUR HEALTH. Loving yourself. Taking care of yourself. Loving and supporting yourself. It is all about taking the time to care for your mind, body, and soul and INFUSE YOUR LIFE WITH LOVE. This is THE year to FALL HEAD OVER HEELS IN LOVE WITH YOUR LIFE AGAIN! Sweep out the old energy. That’s right: clean your house from top to bottom. Chinese tradition believes that you should sweep out the old energy so you can welcome in the new energy into your home. Dust, vacuum, clean your windows, and make repairs on anything that is worn down or broken. Update your wardrobe with things that “spark joy” for you. That’s right– Marie Kondo your closet! This is not about living a minimalistic lifestyle. This is about filling your closet and home with things that you LOVE. Especially with clothes, put together outfits that make you fall in love with yourself every time you look in the mirror. When you feel good about yourself, you will attract more money and love. Guaranteed! Shed what is no longer serving you. Unsubscribe from emails you never read. Unfollow people who post negative stuff on social media. Delete/block/unfriend your crazy ex or other energy vampires in your life. Your happiness matters, and your success will be so much easier to get when you aren’t carrying all this dead weight! Write a list of what aligns with your goals. Write a list of stuff that aligns, like healthy meals, coffee dates with your bestie, working out, yoga, meditating with crystals, taking a walk in the sunshine, regular mani/pedis, and time for creative activities (like painting or singing karaoke!). You can do this with your business too! Write down services that make you smile, products you are proud to sell, choosing marketing platforms that you like! Be sure to add things that bring a smile to your face and light you up inside! (for me, that’s definitely belting the musical ‘RENT’ at the top of my lung and watching reruns of ‘Survivor’ because I’m #obsessed). 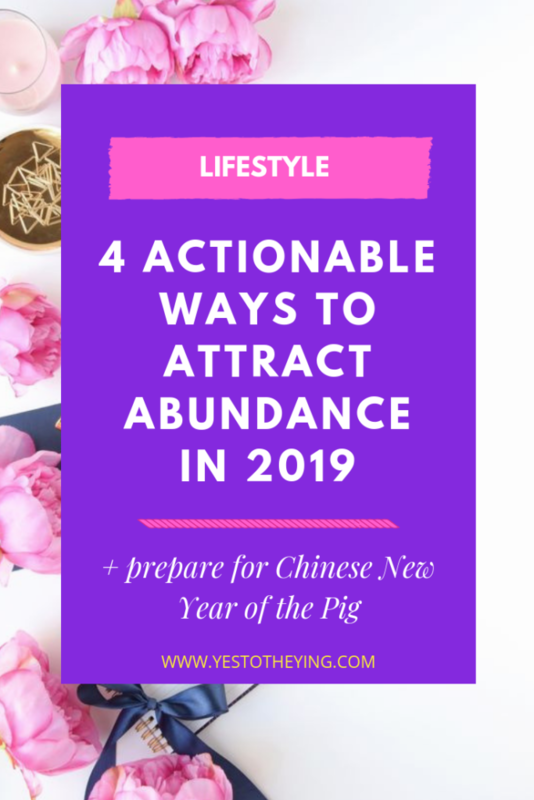 More fun tips on how to take advantage of this Year of the Pig energy to come! In the mean time, celebrate this new loving energy that’s coming in and HAVE FUN sweeping out the old. It’s time to align with who you truly are and what you truly desire and DESERVE. You are so ready to live a life you are wildly in love with! Because Success always starts by saying YES to YOU.